U.S. Sen. 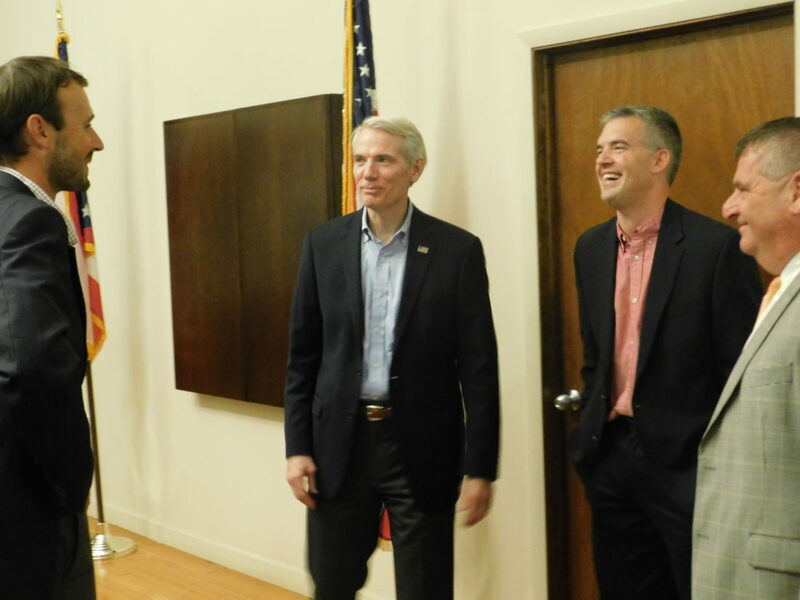 Rob Portman, R-Ohio, visited two communities Tuesday afternoon in Eastern Ohio to talk about jobs, tax reform and infrastructure. Portman made his first stop at American Mud Works Partners Ltd. in Woodsfield, which is expected to bring in more jobs to the Monroe County. Monroe County Commissioner Mick Schumacher, founding American Mud Works member Mark Teinert and other company representatives joined Portman on his tour. Portman also took the opportunity to talk about tax reform. He has supported the Taxpayer Bill of Rights Act, Prevent Targeting at the IRS Act and Fair Treatment for All Donations Act. American Mud Works celebrated with a ribbon-cutting in early August at its location at Industrial Park. The company is based in Texas and services the oil and gas industry with a drilling mud production plant. After leaving Woodsfield, the senator went to St. Clairsville to discuss a $60.5 million water project that Belmont County officials announced in August. Portman met with Belmont County Commissioners J.P. Dutton, Josh Meyer and Mark Thomas, as well as Belmont Sanitary Sewer District Director Kelly Porter, about the preparations the county has made to lay the groundwork for the project. Also in the discussion were Ohio Rep. Andy Thompson, R-Marietta, and David Hall, state director for the U.S. Department of Agriculture’s Ohio Rural Development. Officials said the USDA is providing a $45.5 million direct loan combined with a nearly $15 million grant through the Water and Waste Disposal Loan and Grant Program for projects that include replacing the water metering reading system; the 1965 water treatment plant; the Ohio 9 water booster station; and the Homeside 12-inch water transmission main. They also will install a water distribution system supervisory control and data acquisition upgrade. In addition, officials learned last fall that the county would receive $9 million in loans and $3 million in grants for sewerage improvements. Commissioners also credited Porter for his work in helping to lay this groundwork and for forming a long-range water plan. “He gave us a lot of information throughout the process,” Meyer said. While officials noted the potential of a proposed ethane cracker plant in Dilles Bottom was a likely factor in the investment, Dutton said another step in showing local commitment was the commissioners’ decision in 2017 to raise water and sewer rates.